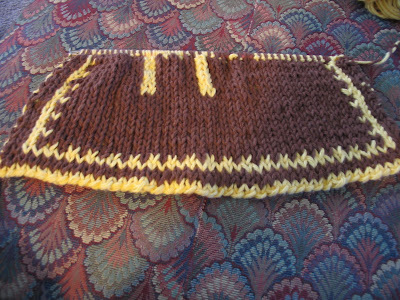 I really gave it a good try, but I really did not enjoy this double knitted cow cloth. This is perhaps the most tedious knitted item that I have tried. The technique is not hard, but very slow going. Hard to tink back and fix mistakes as well. 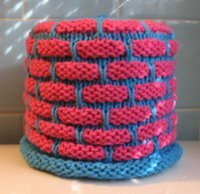 I have done double knitting before using Elizabeth Zimmerman's instructions for a pot holder found in her Knitter's Almanac . 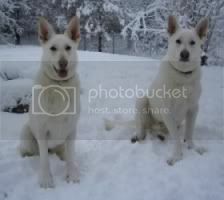 This was a couple of years ago before I had my blog. 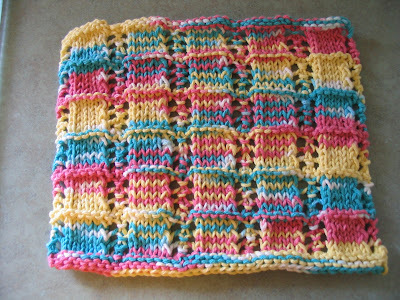 Here's a picture of my Argosy Plain Jane dishcloth: This is the square version of the cloth. I love this cloth. 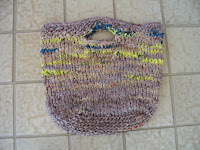 It's a very easy pattern and I think it's great for variegated yarn. There is also another version which I haven't tried yet, but is an argosy cloth done on the diagonal just like the scarf and blanket. I finally have a few more babies to knit for....there are 3 that I know so far. I thought I would try the cute petal bib that I've seen on so many blogs recently. 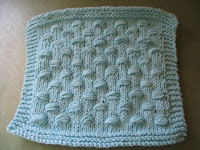 The pattern comes from the One Skein book . I was lucky enough to be able to borrow it from my library. Now I didn't follow the instructions exactly. 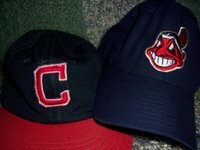 The pattern calls for sport weight cotton. 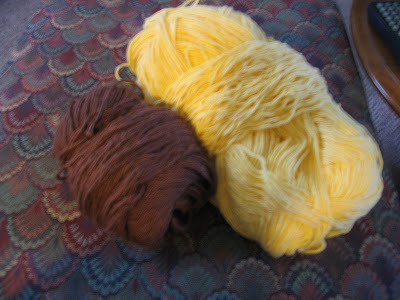 I used my AC Moore mill end yellow cotton which is definitely a worsted weight. The bib part is fine, but the i-cord ties are a bit thick. I think if I make another one I'd probably do something differently with the ties. This is going to be a birthday present for someone I won't name just yet...in case she checks out my blog. I'm filling the bag with a bunch of my cloths. 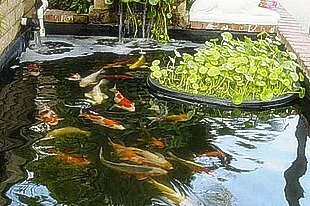 Most of them are chenille or part chenille. I thought she might like the soft cloths. I threw in 2 large Dove chocolate bars and a bar of natural strawberry soap. Hopefully she'll like the drawstring bag fill with the goodies. The last thing I wanted to tell you about is the Sakura Cherry Blossom shawl. I was really disappointed that it went for the minimum bid ($25.00) in my church's silent auction. That is what I paid for the yarn and all that time (over two weeks of pretty steady work) it took to knit although it was very enjoyable. 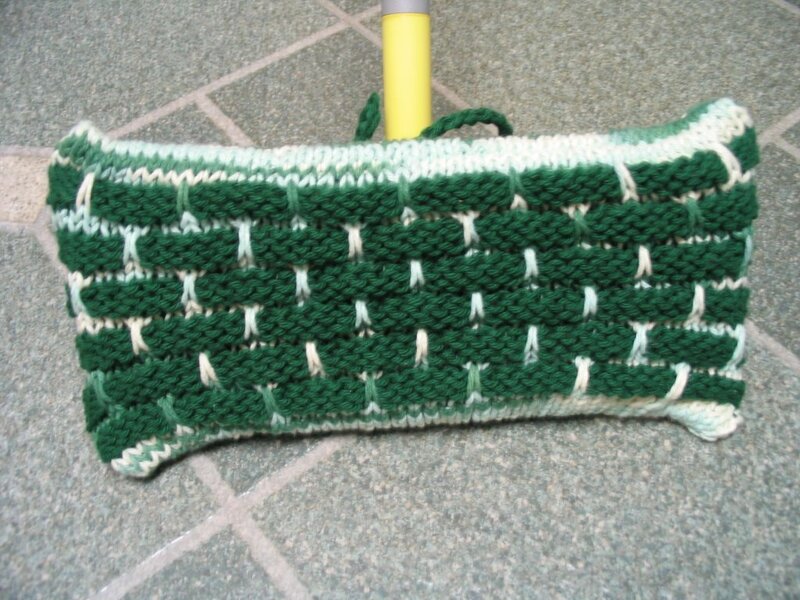 It is really sad that people (general public) do not value a hand knitted item. I doubt that I would ever do that again. :( The only saving grace of the whole thing is that I found a very pretty inexpensive yarn, a beautiful pattern that I really enjoyed working with and so many nice compliments of my work from people (mostly knitters) inside and outside (knitting blog world) my church! wow. have you been busy! the gift is adorable with all the extra cloths included, what a great idea! AND the bib is precious, I love that OneSkein book, I made the cupcakes .. love them. that book is purchas'able'. hope your enjoying you weekend, and can't wait to see how much you get done this week! Love the chocolate/lemon combination. So beautiful. The drawstring bag with goodies is very cute - I'm sure your friend is going to love it! Sorry that the shawl didn't get more - its amazing that it only went for that. Wow you have been productive! Lovely gift bag. I'm sure she'll like it! I loved this little bag as well, but I love bags all forms and sizes. I didn't have the right yarn for it either. I'm sorry about the shawl. That was/is my experience as well. People complain even, about hand knitted costs. Yarn does NOT grow on trees and is not cheap (most of the time). Anyway, don't feel too bad. You did a good thing. Oh no! It looked like you were halfway done with that cloth before you frogged it. I've never tried double knitting before, add that to my long list of techniques to learn, lol! I'm sorry to hear about how the shawl was received. That seems to be the trend (from what I hear) at fund raisers. I don't think the non-knitters appreciate knitted items in the same way knitters do. That is a lovely gift. 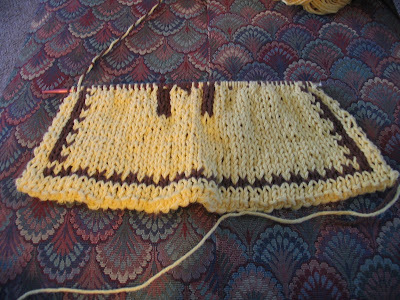 Double knitting intrigues me, but I have a long queue of projects lined up to complete before I really try it. It's too bad about the shawl...it's so pretty. 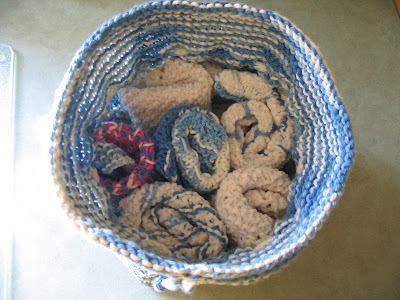 I don't think non-knitters have any idea how much money you can spend on a project, even if it's inexpensive yarn. Plus in my experience people generally don't want to pay much for hand-crafted items. I used to weave baskets and sell them but it just wasn't worth my time for what people would pay. Oh well, somebody got a good deal on a really nice shawl! i can see where that double-knit patterned cloth would be difficult... i did some potholders in double-knit, but not with a design on them and that process was fidgity enough. you always have so much finished knitting to show! how do you make time for it all?! i'm sorry to hear that your shawl didn't get many bids. it was really gorgeous and it seems like it should have done much better! 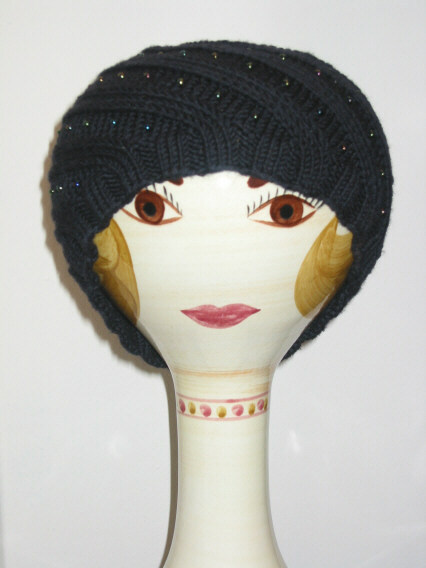 Love everything you've been knitting, Deb! That shawl was gorgeous and deserved to fetch 4 x the price it got! Shame-shame-shame on those Church people! What poops! Can I suggest in the future that you INSIST that the church raffle your handknits instead, as that might draw a greater overall amount for your work? 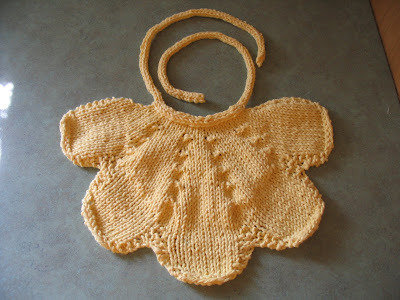 The bib is adorable and I so love it in yellow also! A nice way to practice short row wrapping. Everything I see you create - I am amazed by. 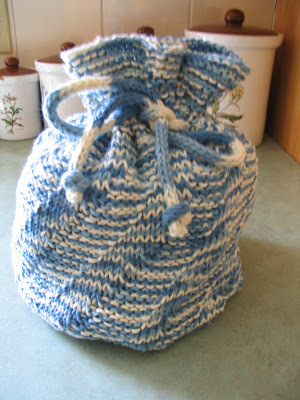 I love your knit drawstring bag and what is contained within. And babies to knit for! What better can there be??? I used the (your) hobnail stitch to put the finishing touch on my last cloth. Thank you! Blessings with each and every stitch. I just have to say that whoever ended up with your shawl is lucky! That, sadly, is the way those things go. Everyone is looking for a good deal, even at fundraisers. Nice looking Plain Jane Argosy cloth! 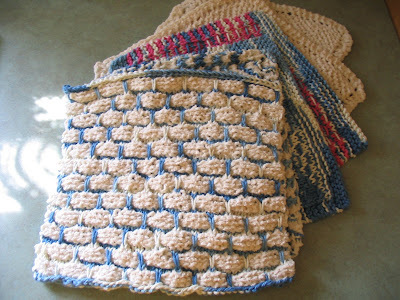 A word of warning: I used my Argosy cloth this weekend (the one on the diagonal) and it gets kinda funky with use. The shape really elongates when it's wet. Still, it's totally useable. I think I should put a warning on the pattern. I love the bag stuffed with cloths. They look like they totally coordinate and are so soft. The giftee is going to love them. And the bib is darling too. I am so sorry your shawl didn't bring a little more money in. I do really like your little gift bag though. What a neat gift idea! i can't believe it only went for $25!!!!!!!! the nerve..but it was for a good cause and like you said, inexpensive yarn and a great pattern. ;) love the petal bib..I've been debating on making one for my niece! what a great bday gift too! So many wonderful cloths! I haven't thought of doing any in chenille; I'll have to try that. The bag is too cool. 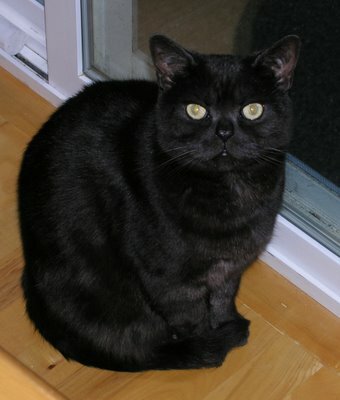 Your shawl was too good for the fund raiser! Tsk, tsk! You have been super busy. I would love that little gift bag full of goodies. I think it is wonderful. Sorry about the disappointing response to the shawl. I had a similar experience at a youth auction at our church. I made several frou frou scarves which were inexpensive to make, and they were fighting over them, but the finer hand knits barely sold for the cost of the yarn. It is baffling.